On 28 October 2015, Gerry got an item in the post which made all the time he'd focused on his canine buddies all the more worthwhile. It was a letter inviting him to judge the long-haired dachshund category at Crufts 2019. For Gerry, from Coleraine, County Londonderry, "it was a dream come true", something he says he had never thought could happen. Asked why he thought he was chosen, Gerry says it was his track record. 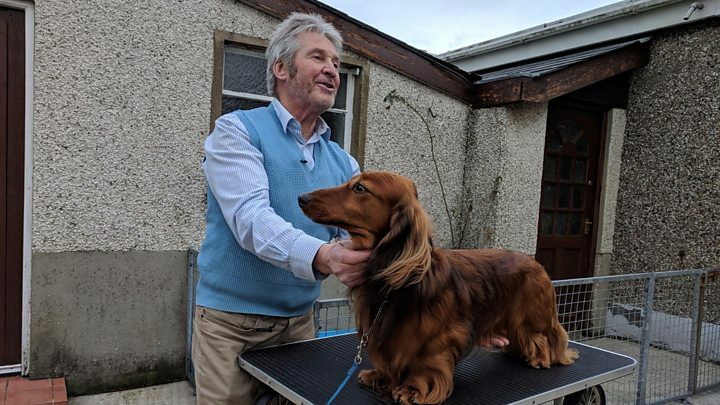 Not only had he three previous Best of Breed awards in the long haired dachshund category at Crufts, but he'd also judged the breed at events around the world. He believes his expertise and his past record qualify him for the honour of being a judge at the prestigious event. Asked if he was nervous at the thought of being centre stage, Gerry was pretty cool about the whole affair. "Once I get into the ring and start judging, I'm concentrating on making sure I choose the right dog. There is no time for nerves, just get on with the job," he says. "I'll have my smart clothes, my green judging jacket and a shirt and tie." The only drawback of being chosen to judge is that he cannot show his own dog. Blaise, the current top dog at his Coleraine kennels, is both a British and Irish champion, but unfortunately he'll have to give this year's show a miss. Over four decades, Gerry, along with his friend Bill Warke, has been working with dachshunds. More than 80 dogs have passed through the kennels over that period. They don't see their dogs as a money-making business. For them, every dog should be entitled to be the best home possible. Unlike others that show dogs, Gerry does not move his dogs on as soon as they are too old to compete. The oldest canine resident at the kennels is Dare, a former champion, and at 14, Gerry wants him to see out his days with him. "Everyone gets a little grey around the edges, but that doesn't mean they are anyway less loved," he says. Each of the 13 dogs currently at the kennels is treated with love. Gerry takes to the green at Crufts on 8 March.